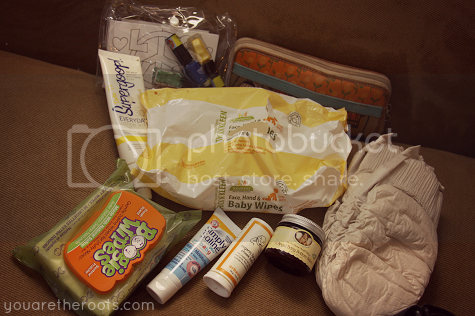 Recently I stumbled upon my What's In My Diaper Bag post from back when Ethan was one and a half months old. Considering he's now one and a half years old (commence my slight freak-out! 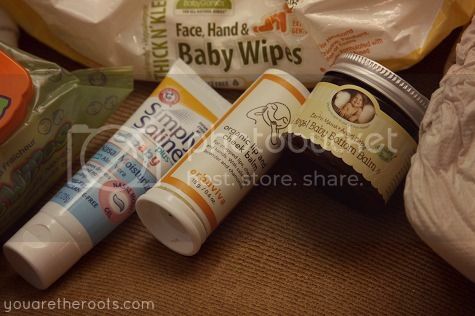 ), a lot has changed in that time frame -- including what's in my diaper bag. I decided what better time than one where there are seven thousand dishes piled up in the sink and the laundry pile is three t-shirts short of an avalanche to stop what I'm doing, cease all productivity and share the contents of my diaper bag?! 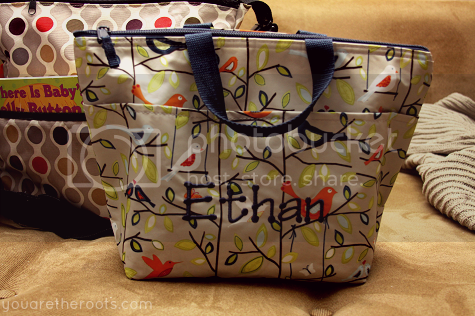 Ethan's personalized lunchbag was sitting on top of my diaper bag (which is a Skip Hop Duo bag, by the way!). 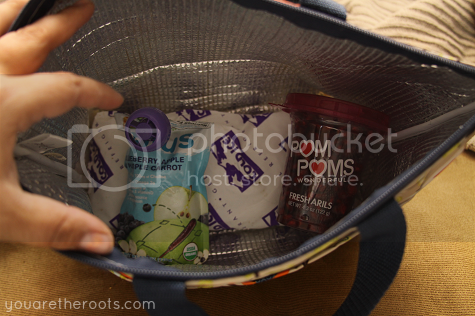 It was packed with some take-along snacks that we brought to My Gym: some pomegranate arils and a fruit pouch. In the outside pockets you'll find my Erin Condren planner (a must! ), my point-and-shoot to capture all the little moments, my barely-functioning Blackberry, CD's from Ethan's latest Kindermusik course, a crayon roll, Ethan's SafeSippy2 water cup and a pair of socks for the both of us. Socks might sound bizarre, but I can't tell you how many times we show up to My Gym or salt therapy without socks. Better to be prepared, right?! In the inside of the bag, you'll find Ethan's size 5 (in my initial post, I was losing my mind that my little boy was starting his size twos!) Seventh Generation diapers, BabyGanics wipes, my wallet, a couple of EZPaints and EZcards, sunscreen, Boogie Wipes, Earth Mama Angel Baby's bottom balm, Erbaviva's organic lip and cheek balm and Ethan's Simply Saline nasal moisturizing gel (sometimes his breathing treatments dry out his little nose area!). What's in YOUR diaper bag?! I don't have a diaper bag... but I am eying up an Erin Condren Life Planner! Right now I use my iPhone calendar, but I swear it deletes things. Do you recommend? 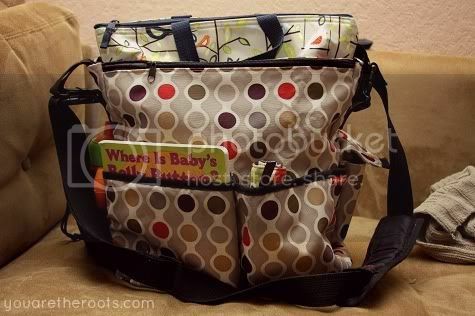 If you didn't have a diaper bag, would it be too big to lug around? I felt the same about my Blackberry calendar and couldn't deal with it anymore. 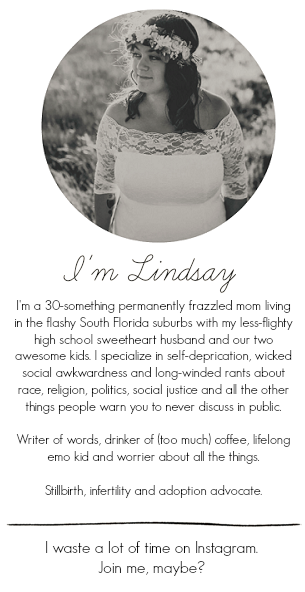 The Erin Condren planner is AMAZING, seriously. I'm obsessed with it! I just love how you can organize by the month AND by the day -- as in, it breaks each day down morning, afternoon and night PLUS to-do list and goals! It's already a lifesaver. I totally recommend it! I think this just might have been the push I needed to order one :) I actually got my mom one for Christmas, and she loves it! She said it's a little big, but I lug around a huge purse and a huge work bag... so what's one my item! Hooray!! I can't wait to see which one you choose! I love the little stickers you can order with the planner, to put the faces of your loved ones and friends on their special days! It makes each month seem that much cuter. This is WAY cute! I must tell you I am mighty impressed that you still have/use the same diaper bag you did the original post on. I guess that also shows the quality- I will have to keep that in mind. Love the lunchbox idea as well! You are so organized- I envy you! Happy weekend! It is filthy and decrepit in the inside, I can assure you! It may or may not have taken a trip through the washing machine prior to this post, haha, but yes! It's a sturdy bag! I do so love it! Everybody ready for a barnyard dance?? Haha. I can recite that book! We have a skip hop too and love it! Hahaha, yes! That book somehow sticks in my head all day. Hahahaha, that's the way I was when I first did this and Ethan was so small and we traveled with SO MUCH! But I'm glad I did it because it was cool to document how it changes over time and now I feel like we carry nothing -- yet I'm sure next year, it'll really be nothing! *sob* Where does the time go?! Boogie Wipes are the best! Does your little one prefer the original or the grape scent? Ethan hates the grape for whatever reason and it makes me sad because I totally like those best, ha! Barnyard Dance is one of our favorites! We don't use the 'diaper bag' anymore. We actually ditched it about 2 months in. We use an army backpack, given to us by my bro after he laughed at me struggling to manuever two babies in their infant seats, with a diaber bag, trying to find my keys, well- you get the picture. The backpack is great! Has diapers and wipes, a change of clothes for each, books, toys, snacks,and the new favorites- matchbox cars and crayons/coloring books. My husband has a diaper backpack but he admittedly never got around to using it -- ever! And here I thought it was such a clever, practical gift for him when I found out I was pregnant! I imagine it's way more practical than the diaper bag -- I feel like I'm always fishing for my keys somewhere! Freedom from the diaper bag! Blissful, I imagine! I don't even remember what a purse looks like at this point!